The Pico Union Project will be opening its doors on Friday, February 12th at 8pm to host a very special LOVE Shabbat event dedicated to celebrating love in all its forms. "Come for the chocolate, stay for the music, leave with love!" The Pico Union Project will be opening its doors on Friday, February 12, at 8pm to host a very special LOVE Shabbat event dedicated to celebrating love in all its forms, be it romantic, platonic, familial, and so forth. Valentines is a holiday that can be tough for many people; The evening intends to shift the paradigm of how Valentines is exclusively for those in a romantic relationship, and will highlight how a loving community is a thriving community. In addition to being a Shabbat celebration, various other religious and non-religious organizations will be co-sponsoring the event to truly make it an inclusive experience that aligns with the vision of the Pico Union Project. All are welcome to join the Pico Union Project in an evening of song, dance, spoken word, wine and chocolate along with such talent as Craig Wedren, Shy Blakeney, Shani Zamir, Chloe Pourmorady, Craig Taubman and many more. 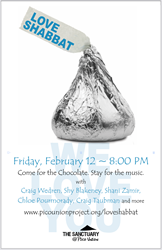 So come for the chocolate, stay for the music, and leave with love.